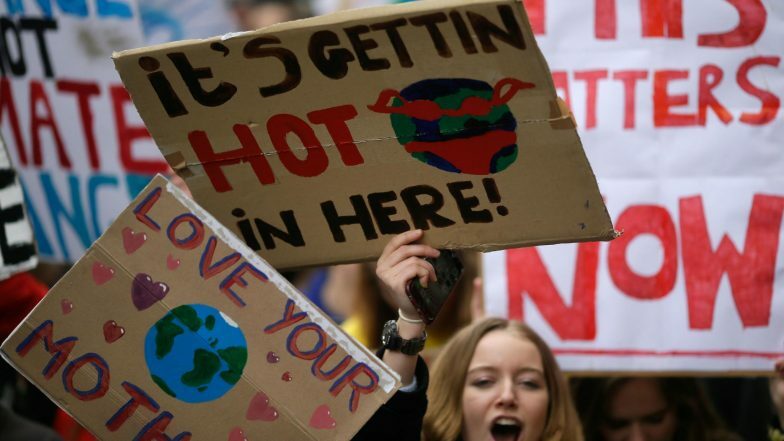 London, Apr 16: More than 100 people have been arrested in ongoing climate change protests in London that brought parts of the British capital to a standstill, police said Tuesday. Demonstrators started blocking off a bridge and major central road junctions on Monday at the start of a civil disobedience campaign that also saw action in other parts of Europe. The protests were organised by the campaign group Extinction Rebellion, which was established last year in Britain by academics and has become one of the world's fastest-growing environmental movements. London's Metropolitan Police said that by early Tuesday 113 adults had been arrested. London Climate Change Protests: Major Roads Blocked. The figure includes three men and two women who were arrested at the UK offices of energy giant Royal Dutch Shell on suspicion of criminal damage. Campaigners daubed graffiti and smashed a window at the Shell Centre building. The majority arrested were seized for breaching public order laws and obstructing a highway. The protest saw more than a thousand people block off central London's Waterloo Bridge and lay trees in pots along its length. Later, people set up camps in Hyde Park in preparation for further demonstrations throughout the week. The police have ordered the protesters to confine themselves to a zone within Marble Arch, a space at the junction of Hyde Park, the Oxford Street main shopping thoroughfare and the Park Lane street of plush hotels. "The information and intelligence available at this time means that that Met (police) feels this action is necessary in order to prevent the demonstrations from causing ongoing serious disruption," the police said. The group wants to governments to declare a climate and ecological emergency, reduce greenhouse gas emissions to zero by 2025, halt biodiversity loss and be led by new "citizens' assemblies on climate and ecological justice". Climate Change Protesters Strip Naked in UK Parliament to Draw Attention on 'Ecological Crisis', Arrested As Pictures Go Viral. Spokesman James Fox said the group had attempted to maintain a blockade overnight at four sites in central London before the police came to impose the new restriction. People were arrested "mostly at Waterloo Bridge where the police came to try to stop everyone, but there were too many of us", he told AFP. Fox said the protesters attached themselves to vehicles and to each other using bicycle locks. "We have no intention of leaving until the government listens to us," he said. "Many of us are willing to sacrifice our liberty for the cause."